Thoughtshower: It’s the Fuel Economy, Stupid! A breakfast debate hosted this week by Green Party MEP Carl Schlyter with NGO Transport and Environment made the business case for stricter van CO2 and fuel efficiency standards. As oil prices rise, fuel has become a significant business cost but it is also a significant environmental cost. According to a Transport and Environment Position Paper, “Vans are one of the fastest growing sources of transport CO2 emissions, increasing by 26% between 1995 and 2010 and now accounting for 8% of EU’s total road transport emissions.” Parcel services, most of which use LCVS (Light Commercial Vehicles) - vans - are estimated to grow by 6% until 2020 due to the rise in e-commerce. 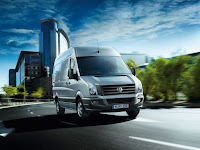 Taking these two factors into consideration, it makes good business sense for a business to invest in a fuel-efficient van, at least on a long-term basis. The 2020 reduction target for emissions from vans is 147 CO2 g/km. During the debate, the delegation of Transport and Environment along with MEP Carl Schlyter and Jeroen Geenen, the representative of Athlon Car Lease International, argued for a further reduction to 118% g/km, backing their arguments with a recent TNO study presented by Richard Smokers from TNO consulting. The TNO study shows how targets below 147 g/km can be met with available technology, how it can be economically-feasible for the auto industry to incorporate them and how long the payback time is – approximately three years according to the study - considering the continuous oil price increase. The question that kept popping into my head during the debate was who can actually drive change to a more sustainable transport future? Is it the European Parliament and Commission with stricter regulations? Is it the targets and the policy instruments that make all the difference in transition markets? Is it the niche business that leases a more fuel-efficient car and allows consumers to test drive it and perhaps help the market develop? Or is it the big car industries that will decide how far it interests them to go? I believe it should be a mix of all these factors. Sustainability is all about incorporating different aspects, views and interests. The transition to a more sustainable transport sector needs to include both bottom up and top down approaches. So, debate is good as a first step towards sustainable solutions, as long as it leads to the next steps.